When I was in college I had a job doing maintenance in a downtown Denver hotel. I didn't really know what I was doing but most things weren't that hard to figure out. One time, though, I needed to repair a broken up concrete door threshold. I removed the old concrete and went down to the hardware store and bought a bag of premixed concrete. I added the amount of water the bag said to use (maybe just a little extra for good luck) and poured it in and troweled it off-another job well done! 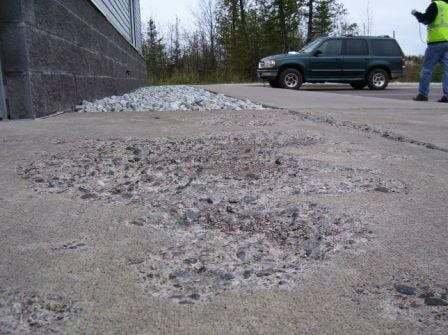 With any concrete repair, take that lesson to heart and you're off to a great start. First figure out what caused the damage, do the necessary preparation of removing any unsound concrete and contamination, then install a repair designed to solve the problem. The worst thing you can do is make a repair that doesn't last. Someone once told me that over 50% of concrete repairs fail again within two years. That is not a track record that inspires confidence. So let's start by evaluating the problem and then we can decide how we are going to make a durable repair. This article is only a very superficial treatment of this subject. For more details, the best source is either the International Concrete Repair Institute or the American Concrete Institute. ICRI, in conjunction with ACI, publishes the Concrete Repair Manual which is over 2000 pages long.